Despite being described online as intuitive, there is no help available as to how to use this, or what it can be used for. I am sure it Might be very useful if only the author will explain its uses, and in particular, how to navigate through it, and how to use it, what it can be used for and how to do this, for each thing it can do. Otherwise I’m baffled by it! Terrible experience. I deleted it right away after try. I second Mr. Dave’s opinion. But I still feel that the little app is useful despite looking and feeling something out of Windows for Workgroups 3.11. You get a drawer system, within each drawer that you can name has a folder(s) with notes. I can see this as a good tool for cataloging a collection of items. Being able to use it via a thumbdrive is also useful. It’s definitely an oddball application, but one I find rather charming despite its shortcomings. This program has potential but needs a LOT of work. Seems like a Win 3.1 program that had a basic implementation but no testing, bug fixes or updates as time marched on (yes, I was around when Win 3.1 started replacing DOS). Author warns you in a ReadMe.txt file and in a .jpg file that it needs to run under WinXP (.txt file) or WinXP Service Pack 3 (.jpg file). Gives me the impression no serious work has been done on this for a long time. User Interface is very poor. When you change a folder title, it doesn’t show on the screen until you click in the folders list. When you open a folder, the description of the first task is shown instead of description of the folder. This thing has been around since 2015 at least, has no one ever used it? Description on the page says you can use your favorite folders or pictures for the drawers. You can’t change colors independently. Clicking the “Change Drawers Color” button (which only shows up after you open then close a drawer) changes ALL the drawer colors at once. 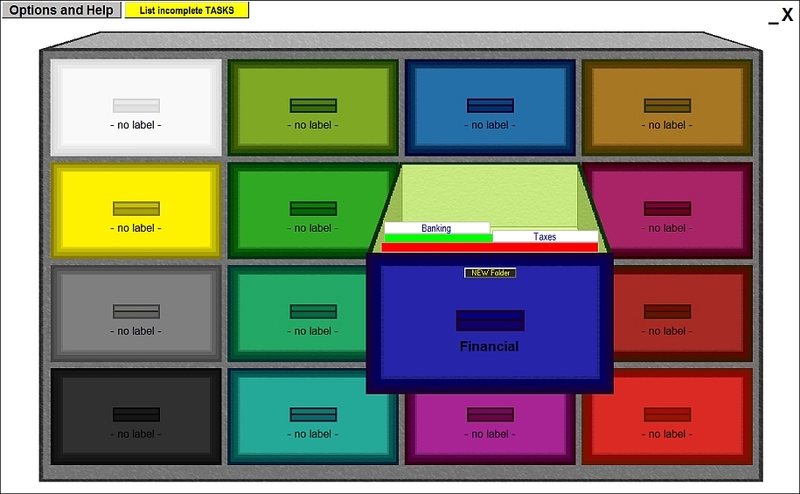 Each click cycles through the next color option, most have all the drawers the same color and one has the mix of colors shown on the SOS Giveaway page. Nowhere is there a way to add a picture (or even an icon) to a drawer or folder. I set a reminder on a task. It asked me to pick a date. There was a blank grey box on in lower left and when clicked the arrows in it (“<>” characters, not arrows) it showed, then changed to a different month. It never showed any dates within the month, just an empty box. I clicked inside where dates would likely be, and it assigned July 18 for my reminder. No way to make it weekly or monthly or daily or every third tuesday, this program is designed only for tasks with a specific end time (or start time, or week-before-start time, however you want to interpret the reminder date). When I exited the folder and drawer, then reopened them, my reminder time was no longer displayed. There’s a status column with a checkbox to mark as Complete or Incomplete. I assume checking the box marks it complete. I didn’t see any way to hide complete tasks but there’s a report that run the lists incomplete tasks. If you change anything (like marking tasks complete or adding new ones) you won’t see your changes in the application until you exit completely and restart it. I like the drawer / folder(project)/ task approach. And folders can have subfolders although I didn’t test this out. This is definitely for casual use, since there are no task dependencies (Task A & B need to finish before C can start), no way to assign a duration or start or finish date or track progress. Seems suited for remembering birthdays and as in their examples, when bills / taxes are due. I could see using drawers for Birthdays, Bills, House Repairs, Car Maintenance, Long-Term Plans, Vacation to-do lists, Shopping lists, and maybe track doctor appointments/medicines prescribed. But the complexity and buginess of the interface really makes me wonder why it’s any better than using a simple .txt file with Notepad? You could have a folder on your hard drive that contains a text file for each “drawer”, or even subfolders for each “drawer”, and then add whatever you want in the text files. Easy. All you would miss is the list of all incomplete tasks. At work, I use a single notepad file and move completed tasks down below the incomplete tasks as I get them done. First few characters of each line say what project the tasks relate to. Works for me. I ran this on a Win 10 64-bit system, lots of memory, NVidia GTX 750 Ti graphics. It may work better on your system! I could see this program being useful if the author would get 10 people to try it, listen to what they say, and implement their suggestions. I can put up with bad graphics and colors if the functionality is helpful and solid. II am the author of the software. I have made this software for someone (long time ago), respecting his requirements. The date box should be visible… i don’t know why on your computer is not shown. For the rest of the issues, you are right but, in order to fix things and improve the program i need to see people are interested and willing to buy a license. I appreciate your review and i will try to fix things and improve the program in the future versions, as long as I will have time for this. Most of errors you pointed out are related to your system only. If your system allows the software to properly run and you follow the instructions included the program will work.